This is an endearing children’s book about an orphan whose irrepressible nature earns her a family and a place in the community. Anne Shirley is sent to Prince Edward Island to the home of a middle-aged brother and sister who want to adopt a boy to help run Green Gables — their Avonlea farm. Anne is bright, eager to please, talkative and has a wild imagination. Matthew Cuthbert loves her right away. Marilla Cuthbert wants to send her back — but relents. 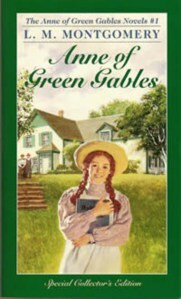 Anne drives Marilla crazy with antics such as mistakenly dying her hair green, and inadvertently getting her best friend drunk. At 16, she goes for a teaching license with friend, Gilbert Blythe. She does well and earns a scholarship to pursue a bachelor’s degree, but when tragedy occurs, she gives it up to return home. Gilbert switches teaching slots with Anne, an act that cements their growing relationship. This book is old-fashioned, harkening back to a simpler time. Reading it, or another in the series, is like eating meatloaf on Sunday — comfort food for the mind.